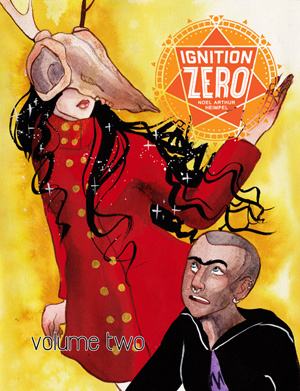 The second printed volume of webcomic Ignition Zero follows Orson, Robbie, and friends as they continue to get deeper and deeper into the supernatural side of Glory, Maryland. The quartet continues to be hunted by the skull-wearing spirit Vaidya, whose strange obsession with Ivory–the land spirit the four of them have vowed to protect–becomes more confusing and mysterious….some people just aren’t what they seem. Ignition Zero boasts a cast diverse in sexual orientations, gender identities, race, ethnicities, ability, and personality. The romantic subplot of the series centers around two asexual characters–Robbie and Orson themselves–and the romance blossoming between them. Volume 2 contains Chapter 4-6 and an 11 page bonus comic. Pg-13 for frequent obscenities. Full color, 160 pages.